Graziano Prà owns 37 hectares of vines in Veneto’s two most famous winemaking areas, Soave Classico (30 hectares) and Valpolicella (7 hectares). While his recent foray into the world of red wines has been highlighted by the production of outstanding Valpolicella and Amarone wines, further confirming the estate’s reputation as one of the very best in Italy, there is no doubt Prà has always been viewed as a quintessential white wine producer. Prà makes four different Soaves, starting from the entry-level Soave Classico Otto up to the oak-aged, ultraripe Colle Sant’Antonio. Grapes are sourced from a number of famous crus in the Soave and Soave Classico production zone: Froscà, Foscarino, Montegrande, Monte Bisson, Ca’ de Napa, Terzo Capitello, Ponsara, Val dell’Acqua, and Costalta. The best thing I can say about this estate is that I always have a hard time selecting the most noteworthy wine in the lineup. For this special Vinous report, I opted for a vertical of the Soave Classico Monte Grande, a wine Prà first made in the 1988 vintage, but I could just as easily have tasted and written up the Soave Classico Colle Sant’Antonio (in some years just a little too rich and oaky for my taste) or the Soave Staforte (the only non-classico Soave Prà makes). Basic Soave wines are made in a large swath of mostly flatland vineyards planted on more fertile soils of different geologic origin than those of the delimited Classico area, the smaller, much more hilly part of the region that has historically been associated with production of the best Soaves. 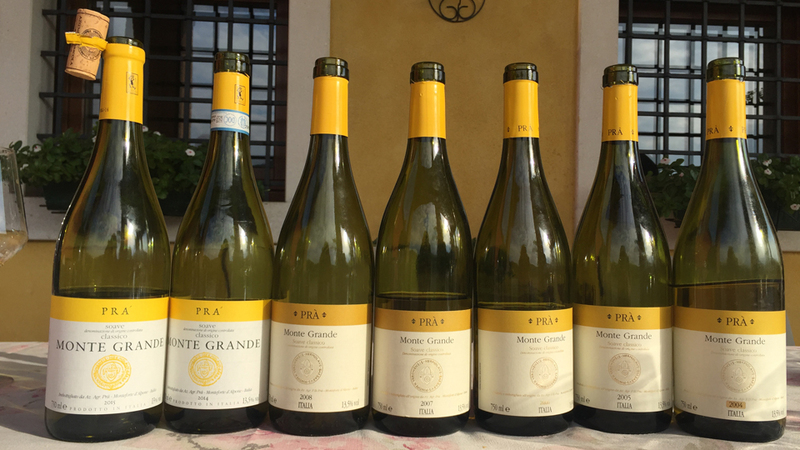 Arguably, Prà’s best wine is the Soave Classico Monte Grande, of which he makes roughly 1,250 to 1,500 cases a year, depending on the vintage. There are many things I like about this wine, first and foremost the fact that, despite being a rather expansive style of Soave (but never in the gargantuan mode of the Colle Sant’Antonio), it manages most years to deliver noteworthy ripeness and volume without camouflaging either its specific terroir or the native varieties from which it is made. Monte Grande is an extremely thought-provoking Soave Classico for a variety of reasons. For one, it has always been made only with grapes grown in the Monte Grande cru, where Prà owns four hectares, and so it is a site-specific wine. The naturally low-yielding Monte Grande vineyard is located about 150 meters above sea level in the Monteforte d’Alpone area of Soave Classico. This is important, because Monteforte d’Alpone is characterized by soils that contain less limestone than those of nearby Soave but are richer in basalt and volcanic elements. I find that the Monte Grande cru can deliver powerful, mineral-rich Soaves that speak of Monteforte d’Alpone and are quite different from the lacier, more floral, more acid-driven Soave Classicos of the Soave area. It’s safe to say that it was the Prà estate that first made wine professionals and civilians alike aware of the huge quality potential of the Monte Grande site. Furthermore, as Prà’s vines here are now roughly 40 years old, they are able to consistently produce terroir-driven wines. Although the Soave Classico Monte Grande started out life as a “normal” Soave Classico in that it was initially fermented and aged in stainless steel only, as most wines were at the time, things have changed over the years. Once the Monte Grande grapes are destemmed and pressed softly, the fermentation is carried out at about 18°C in large casks made of Allier oak. But beginning with the 1998 vintage, Prà began aging Monte Grande for six to eight months in large (15-hectoliter) Allier oak barrels, and starting with the 2002 vintage the estate switched to still larger 30-hectoliter barrels. The move toward larger receptacles was clearly constructive, as the wine has never been as pristine and precise as it is nowadays. The estate continues to use the 30-hectoliter format today, where the Monte Grande Soave matures for roughly 10 months prior to being bottled. 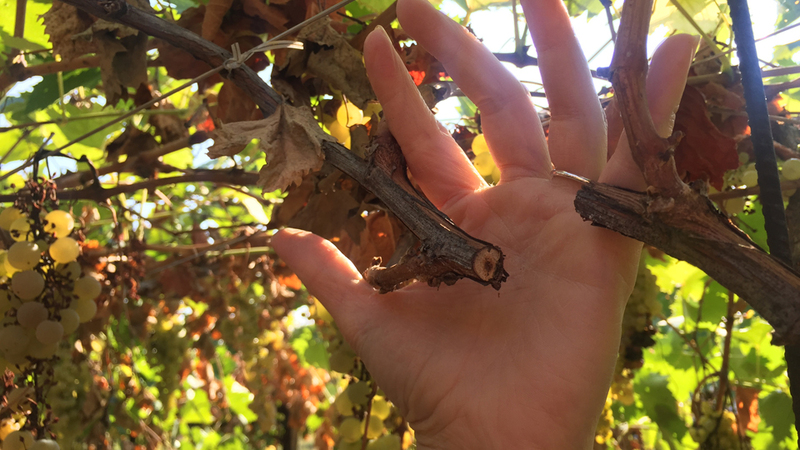 Another very important element that differentiates the Monte Grande from most other Soave wines is that it has always been produced by twisting the stalks of the clusters once the grapes have reached optimal maturity, in order to interrupt lymphatic flow. This procedure causes the grapes to air-dry directly on the vine, leading to richer, more concentrated juice in the grapes. It also helps confer a luscious mouthfeel to the wines (the air-drying lasts for about a month, although clearly its duration depends on vintage characteristics). Today, the Monte Grande is a distinctive blend of 70% Garganega and 30% Trebbiano di Soave, a rarity among wines of Soave. But it is this unusual blend that I believe allows a glimpse into the future of Soave and Soave Classico wines, which today are normally made entirely from Garganega or mostly from that variety with the addition of small percentages of Trebbiano di Soave, Chardonnay or Sauvignon Blanc. Up through the 2000 vintage, Monte Grande was 100% Garganega; then in 2001 Prà replaced 30% of the Garganega with Trebbiano di Soave, giving Monte Grande the same blend as the wine that is perhaps the most famous Soave of all, Pieropan’s Calvarino bottling. 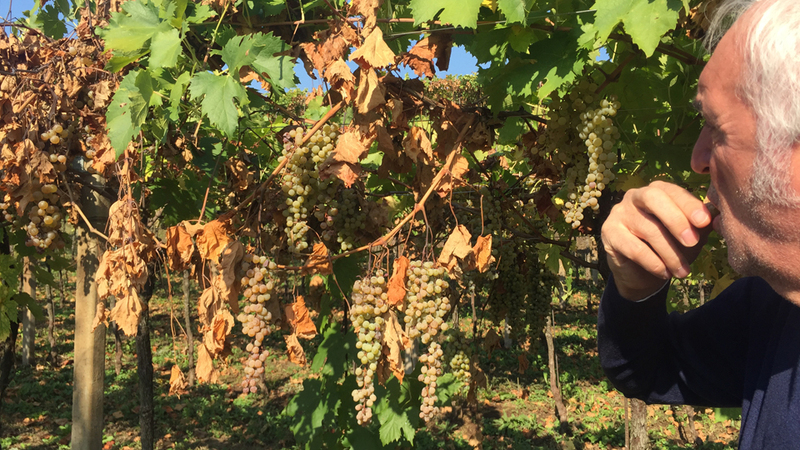 Graziano Prà finds that Trebbiano di Soave adds freshness and minerality (he generally harvests it in mid-September, depending on the vintage). Meanwhile, the Garganega grapes are usually picked in mid-October, after roughly a month of air-drying on the vine. Prà likes this combination of Garganega and Trebbiano di Soave as he finds the final blend not just more concentrated and tactile but also more vibrant than it would be without the Trebbiano di Soave. In some vintages, such as 2003 and 2005, the Monte Grande blend has been closer to 80% Garganega and 20% Trebbiano di Soave because of a smaller than usual Trebbiano di Soave crop (owing to drought in 2013 and to hail in 2005). Why is the Monte Grande’s 30% Trebbiano di Soave component so worthy of note, you may ask. It’s for the simple reason that it offers us a chance to stand before a looking glass into the future. For decades, all we have ever heard in Soave land is that the best Soave and Soave Classico wines are made with 100% Garganega. 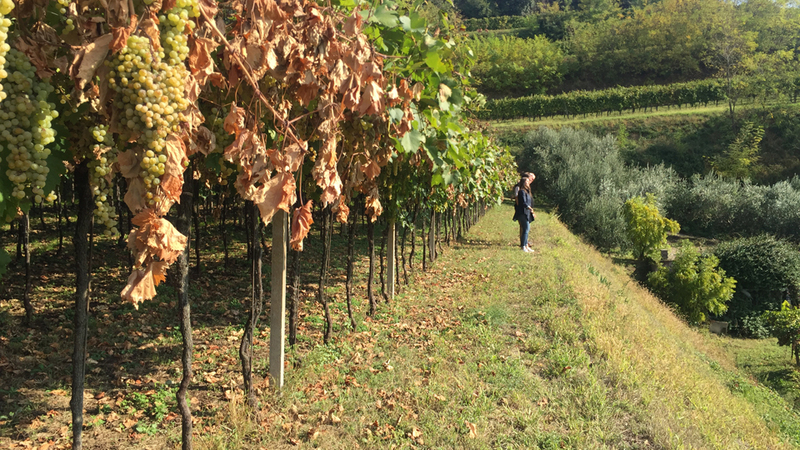 That may well be true; and although it frankly never once struck me that Garganega was a great wine grape – and certainly not at the high crop levels encouraged by most growers in Soave – I took that statement at face value until I started to think a little more about the whole issue. Garganega is undoubtedly an outstanding grape variety when grown by competent producers who curb its natural vigor and its tendency to produce too many grapes. But why is it that two of the top six or seven wines of the entire Soave area are made with 30% Trebbiano di Soave in the blend? Is it just a coincidence? I don’t think so. When you realize that Trebbiano di Soave has been scientifically proven (thanks to carefully done ampelographic and genetic studies) to be a local biotype of Verdicchio, which is generally regarded by wine experts all over the world as one of Italy’s three or four greatest white varieties (along with Fiano, Carricante, the real Trebbiano Abruzzese and, yes, Garganega), then the fact that a 70/30 Garganega/Trebbiano di Soave blend is so successful can hardly come as a surprise. Think about it: over the past 30 years or so we have witnessed many forgotten, previously underappreciated grape varieties rise to the top in Italy’s quality hierarchy. The Falanghinas (plural, for there is more than one Falanghina variety), Pecorino, Trebbiano Abbruzzese and Carricante are just some of the examples that spring immediately to mind. Even Fiano was destined for extinction as recently as the 1950s, and we are all better off that it hasn’t gone the way of the dodo bird. Thanks to a few courageous, forward-thinking producers who took a chance on grapes that lived in their own back yards but that nobody else cared about, we have many more interesting Italian wines to enjoy today. It may well turn out that the fortunes of Trebbiano di Soave, a delicate thin-skinned variety that most producers uprooted in favor of Chardonnay back in the 1980s, will undergo a similar renaissance. Of course, we can’t be certain that we will see an increase in the presence of Trebbiano di Soave in wines made in the Soave area over the next decade or two. A change like this will be tricky and will depend on many pieces falling into place. It will also rely on producers having old vines (or the patience to let their vines age) of the real Trebbiano di Soave, and not of the lesser Trebbiano Toscano or other cultivars that can easily be confused with Trebbiano di Soave. Clearly, if producers add Trebbiano Toscano instead of the real thing, all bets are off and Trebbiano di Soave cannot help but get a bad rap in the process. And so, provided that authentic Trebbiano di Soave begins to play a larger role in Soave wines than it has up to now, perhaps the world-class 70/30 blends of Garganega and Trebbiano di Soave that are made by Prà and Pieropan today will be replicated by additional competent producers. The wines in this article were sourced and tasted at the Prà winery in October 2016 with Graziano Prà.